For those moments where you need something more powerful than a speedlight but without carrying a massive unit, a small monolight can usually do the trick. 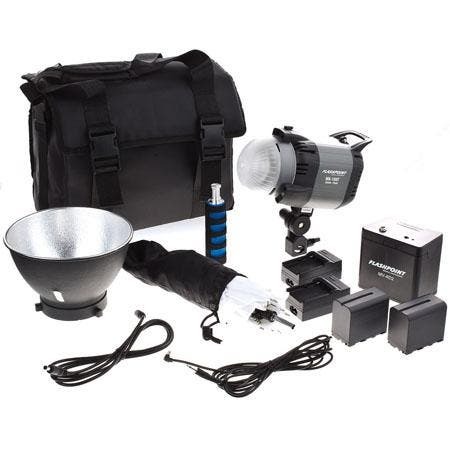 Adorama has unveiled their new Flashpoint 180 Monolight kit complete with batteries, umbrella, umbrella reflector and of course the monolight itself. And all this is going for only $199.99. In all honesty, that’s a steal, but I wish that the unit were smaller and more speedlite-like in design and interface. The light has a Bowens mount for a bunch of different light modifiers and it also has a stepless knob to control it for five different stops of power. The only thing that would make this deal sweeter is radio controls included with the kit. However, we’re not complaining–but please do note that monolights and speedlites work in completely different ways and have different flash durations. Which One is Sturdier? Canon T5i or Nikon D5200?